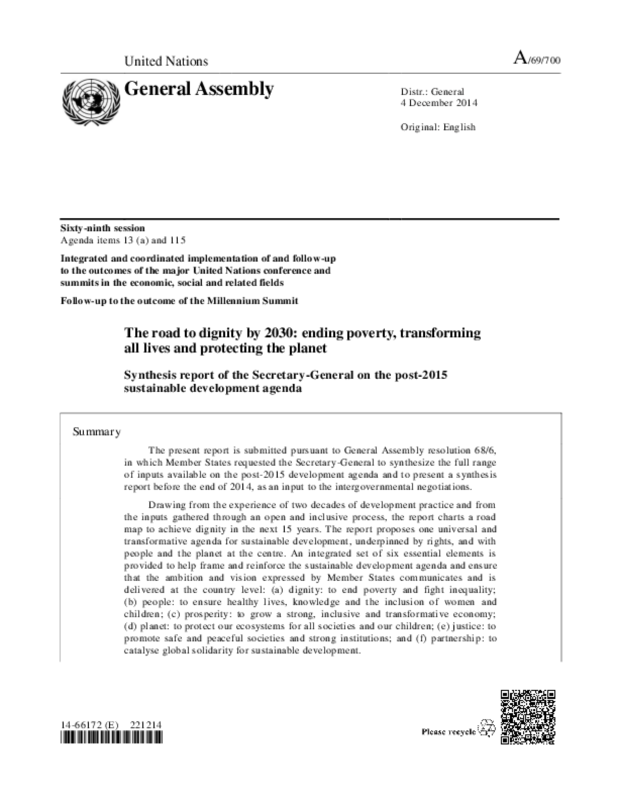 The present report is submitted pursuant to General Assembly resolution 68/6, in which Member States requested the Secretary-General to synthesize the full range of inputs available on the post-2015 development agenda and to present a synthesis report before the end of 2014, as an input to the intergovermental negotiations. Drawing from the experience of two decades of development practice and from the inputs gathered through an open and inclusive process, the report charts a road map to achieve dignity in the next 15 years. The report proposes one universal and transformative agenda for sustainable development, underpinned by rights, and with people and the planet at the centre. An integrated set of six essential elements is provided to help frame and reinforce the sustainable development agenda and ensure that the ambition and vision expressed by Member States communicates and is delivered at the country level: (a) dignity: to end poverty and fight inequality; (b) people: to ensure healthy lives, knowledge and the inclusion of women and children; (c) prosperity: to grow a strong, inclusive and transformative economy; (d) planet: to protect our ecosystems for all societies and our children; (e) justice; to promote safe and peaceful societies and storng institutions; and (f) partnership: to catalyse global solidarity for sustainable development. Copyright 2014 United Nations General Assembly.